6A1-UL9029-3 - Seven, Six, and Five point throwing stars. 4 inch in diameter. 3 piece Ninja throwing star with a black nylon carrying sheath with belt loop. Enjoy hours of fun outdoors and indoors with these sure stick Khoga Ninja Throwing Star 3 piece Set. It includes a Seven, Six, and Five point throwing starts which is approximately 4 inch in diameter. They are very thick and sturdy and are made from a satin finish 440 stainless steel. The length of the blades measures 1 inch. 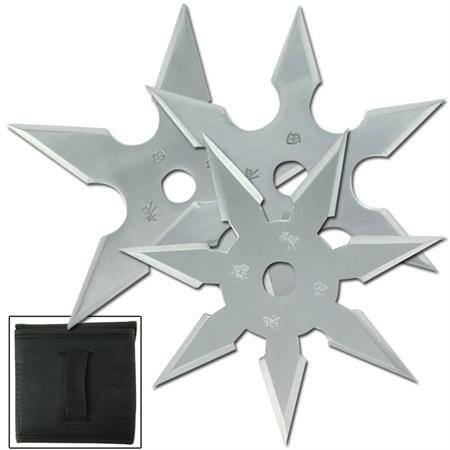 Also, the ninja star has Chinese engravings on it for a more authentic looks and feel. The package includes 3 piece Ninja throwing star with a black nylon carrying sheath with belt loop. Be careful with these stars because it is very sharp.